Social and other networks have been shown empirically to exhibit high edge clustering — that is, the density of local neighborhoods, as measured by the clustering coefficient, is often much larger than the overall edge density of the network. In social networks, a desire for tight-knit circles of friendships — the colloquial “social clique” — is often cited as the primary driver of such structure. Construction of a number of specific families of equilibrium networks, including ones showing that equilibria can have rather general binary tree-like structure, including highly asymmetric binary trees. 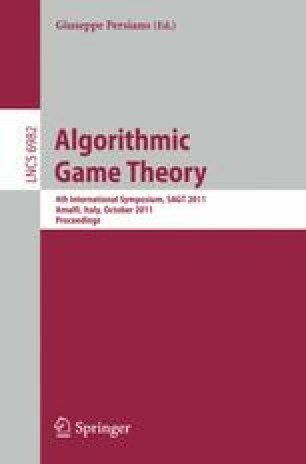 This is in contrast to other network formation games that yield only symmetric equilibrium networks. Our equilibria also include ones with large or small diameter, and ones with wide variance of degrees. A general characterization of (non-degenerate) equilibrium networks, showing that such networks are always sparse and paid for by low-degree vertices, whereas high-degree “free riders” always have low utility. A proof that for edge cost α ≥ 1/2 the Price of Anarchy grows linearly with the population size n while for edge cost α less than 1/2, the Price of Anarchy of the formation game is bounded by a constant depending only on α, and independent of n. Moreover, an explicit upper bound is constructed when the edge cost is a ”simple” rational (small numerator) less than 1/2. A proof that for edge cost α less than 1/2 the average vertex clustering coefficient grows at least as fast as a function depending only on α, while the overall edge density goes to zero at a rate inversely proportional to the number of vertices in the network. Results establishing the intractability of even weakly approximating best response computations. Several of our results hold even for weaker notions of equilibrium, such as those based on link stability.